When I learned that Ernesto Cardenal was coming to S.F. in May, 2015, I thought about the impact of the Nicaraguan and other Central American revolutionary struggles in the early 1980s on the City. When Cardenal was in the Sandinista government (as Minister of Culture, I believe), his brother Fernando came and spoke in 1981 at an event put on by Casa El Salvador on 24th St. 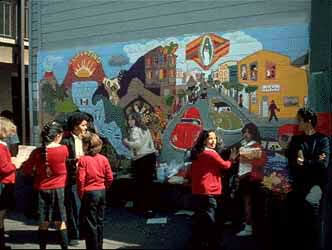 I was the last CETA (Comprehensive Employment and Training Act) Community Muralist 1980-81, and had begun working with the Club Latino of St. Peter's School on a project...and almost immediately was dating a teachers' aide there named Laura, who was involved in Casa and solidarity work around Central American struggle. We attended, and stern Sr. Cardenal spoke in Spanish, which was then translated. At one point, asked why the Sandinistas had put so many people in prison, he replied because we didn't shoot them. 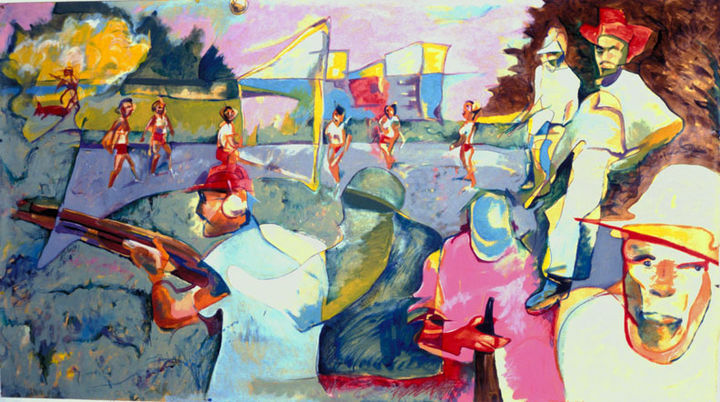 As I'd also just gone back for grad school in Painting at SFSU, all the buzz around Central America got me beginning a series of big paintings 1981-83 on paper about the conflict too. Often I'd work all night on a big piece of paper tacked to the wall of my studio, 47 Clarion Alley. I exhibited these at SFSU, but also some at La Peña Cultural Center in Berkeley, Modern Times bookstore, and Mission Cultural Center. In 1976, while still in college, I visited Costa Rica, Nicaragua, Honduras and El Salvador, and was moved by the unfinished cathedral where Archbishop Romero presided. To a Fall, 1982 meeting of the Balmy Alley mural project at Ray Patlan's 29th Street studio (the space had been the Democratic Socialists of America's Socialist School only a couple years before), I brought my color sketch for a mural joining the assassinated Romero and activist S.F. priest Cuchulain Moriarity, who saw Central American refugees suffering like victims of Northern Ireland's religious oppression, but all the Alley walls had already been assigned to artists. A couple years later there was a local spinoff of the New York-based Artists' Call against intervention, but I didn't participate. Several demonstrations against US intervention in Central America drew large crowds of left-of-center activists of all of all persuasions—Communist, Trotskyist, anti-authoritarian, artistic. One demonstration in 1982 my roommate (and since 1985, wife) filmed with a Super 8mm camera for a City College Film class project, which made some people suspect she was a police agent. The last grand Central America demonstration I attended around 1983 circled the Jack Tar Hotel when El Salvador's President Duarte stayed there. The phalanx of police clubbed at least one glasses-wearing female student, whose picture, dazed and kneeling, appeared in the SFSU newspaper. Standing in a crowd on Van Ness Avenue, liberal SF Supervisor Nancy Walker, Berkeley Mayor Gus Newport and I were almost shoved through the picture window of a bakery by a mounted policeman's nervous horse. An angry cop ran after a demonstrator, and his pistol flipped out of his holster to the ground. I razzed him for his unprofessionalism as I gave it back, but had I instead hopped on a fast MUNI bus or hailed a taxicab, I would have the firearm as a souvenir to show friends today.